Okpara said, “We wish to alert Nigerians to a new plot by the same people, whose first shameful attempt to unlawfully overthrow the leadership of the National Assembly failed; an attempt, which brought Nigeria to the bad international limelight. “We have it on good authority that a fresh plot is being hatched to make another attempt to cripple the parliament in the guise of impeachment, even when they know that there is not the constitutional majority to achieve the sinister move. “Today, our country is facing the challenges of pervasive insecurity, massive joblessness and unemployment, ethnic irredentism and disunity. We enjoin the National Assembly to use its constitutionally guaranteed powers to legislate to arrest the slide; to give the country a new direction and create hope for our countrymen and women,” he pleaded. Also on Thursday, The Senator representing (PDP, Bauchi) Isah Misau, debunked claims by the National Leader of the APC, Asiwaju Bola Tinubu, that the National Assembly was planning to impeach President Muhammadu Buhari. Misau made the rebuttal in a statement in Abuja on Thursday. He urged Nigerians to disregard what he described as an empty talk by the APC chieftain. Misau said, “I am surprised that a politician of Tinubu’s calibre will be playing politics with a serious issue like the impeachment of the President of the country just because he wanted to catch the attention of a crowd. Politicians at his level should not be engaging in unnecessary sabre-rattling and empty speculation. Still, on Thursday, the European Union said the 2019 general elections in Nigeria were vital to ensuring stability and prosperity. It demanded that Nigerians must decide the outcome of the elections. The union, in a statement, also condemned the siege laid to the National Assembly complex by the operatives of the DSS, noting that law enforcement agencies must remain neutral in the political process. The union said, “The EU Heads of Missions have noted with concern interference in the democratic process by law enforcement services, the most recent case being the barring of access to the National Assembly on August 7. The EU is fully committed to supporting democracy in Nigeria and it commends the Federal Government’s swift action to protect the independence of the National Assembly as a critical pillar of democracy. Five suspects arrested in connection with the April 5th bank robbery in Offa, Kwara State and killing of 30 persons in the state have confessed to their alleged links with Senate President Bukola Saraki and Governor Abdulfatah Ahmed. During the investigation, the police stated that the five gang leaders allegedly admitted and confessed that they “have been sponsored with firearms, money and operational vehicles” by Saraki and Ahmed. The suspects, who were arrested in the wake of the robbery incident, had made confessional statements alleging that they were political thugs of the Senate President. Parading the five suspects and eight others yesterday in Abuja, Force Public Relations Officer (FPRO), ACP Jimoh Moshood, said the suspects operated under the name of Youth Liberation Movement (a.k.a Good Boys). To buttress their case against the Kwara State Governor, the Police noted the separate apprehension of Messrs Alabi Olalekan and Yusuf Abdulwahab, Personal Assistant (Political), Chief of Staff to the Governor, respectively. The police gave the names of the suspected political thugs, who were said to be the gang leaders of the bank robbery, as follows: Ayoade Akinnibosun, Ibukunle Ogunleye, Adeola Abraham, Salawudeen Azeez, and Niyi Ogundiran. The quintet was among eight other suspects paraded at the Force Headquarters, yesterday, over the robbery incident, which claimed 33 lives, including pregnant women and nine police officers. According to Moshood, “The five gang leaders confessed and volunteered statements to the Police investigators, giving a clear account of how they planned and carried out the bank’s robbery operation in Offa, the attack on the Police Division in Offa and how they killed the 33 innocent persons during the robbery. “The five gang leaders further confessed during the investigation that they are political thugs under the name Youth Liberation Movement, a.k.a “Good Boys”. He further alleged that a Lexus Sports Utility Vehicle (SUV) with a sticker bearing “Saraki” was used for the robbery incident. “In the course of discreet investigation into the confessions of these five gang leaders and the other 17 principal suspects, a Lexus jeep GX-300 (Ash Colour) with a sticker plate number with inscription “SARAKI” “Kwara, State of Harmony” used by the gang leader (Ayoade Akinnibosun ‘M’ 37Yrs) during the bank robbery and the killing of the 33 innocent persons was taken to Government House, Ilorin on 16th May, 2018 where the sticker plate number with inscription “SARAKI” “Kwara, the State of Harmony” was removed before another plate number (Reg. No. Kwara, KMA 143 RM) registered in the name of Ayoade Akinnibosun, the overall commander of the Offa bank robbery was then attached to the vehicle to cover up the identity of the said vehicle. “The exhibit vehicle was subsequently recovered from the premises of the Ministry of Environmental and Forestry in Ilorin, Kwara State. While the sticker plate number with inscription “SARAKI” “Kwara, State of Harmony” removed from the vehicle was recovered from one Adeola Omiyale who drove the said Lexus Jeep to Government House, Ilorin immediately after the bank robbery,” the police said. This was as the Police said two guns were recovered from one of Governor Ahmed’s aides in custody. The police: “The Personal Assistant (Political) to the Executive Governor of Kwara State, Mr. Alabi Olalekan, who is privy to information that the Police are looking for the Lexus Jeep as an exhibit used in the Offa bank robbery and the killings of 33 innocent persons directed one Adeola Omiyale to relocate the Lexus Jeep to Government House, Ilorin. “The PA (Political) is currently in Police custody and has made useful statement assisting the Police in further investigation into the case. A revolver pistol and pump action gun were recovered by the Police Investigation Team from the Personal Assistant (Political) to the Governor of Kwara State, Mr Alabi Olalekan’s farm where he directed his brother to hide them after his arrest by the Police. “In order to conceal evidence, the Chief of Staff to the Governor of Kwara State, Mr. Yusuf Abdulwa-hab, who has been arrested and taken into Police custody, arranged the removal of the sticker plate number with inscription “SARAKI” “Kwara, State of Harmony” from the exhibit vehicle and also registered the exhibit Lexus Jeep used in the Offa bank robbery and the killings of 33 innocent persons in the name of Ayoade Akinnibosun, the overall Gang Commander of the Offa bank robbery while the Ayoade Akinnibosun was already in Police custody for more than six days before the registration of the vehicle.” While noting that efforts to arrest other suspects were ongoing, the police said they will continue to carry out their constitutionally- guaranteed duties, with a view to enthroning a peaceful and orderly society. “The investigation into the Offa bank robbery and gruesome killings of more than 33 innocent persons in Offa, Kwara State on the 5th April 2018 directed by the Inspector-General of Police, IGP Ibrahim Idris, has made significant progress, successes and more revelations have been recorded. “The gang leaders and some of the principal suspects arrested for their active participation in the robbery and the killing of innocent persons have made confessional statements admitting to the various criminal roles they and their sponsors played in this dastard and heinous crime. 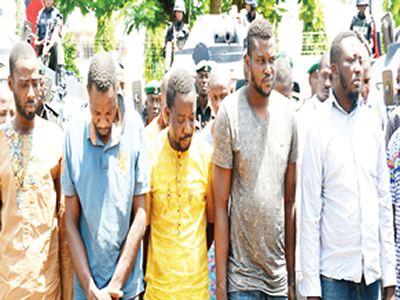 “The five gang leaders and some of the other 17 suspects arrested for direct involvement and active participation in the Offa bank robbery and the gruesome killing of 33 innocent persons which includes (some pregnant women and nine Police personnel) admitted, confessed and volunteered statements that they were political thugs of the Senate President, Federal Republic of Nigeria, Senator Bukola Saraki and the Governor of Kwara State, Alhaji Abdulfatah Ahmed,” the Police said. The Force further noted that the arrest of the “political thugs”, and others, was facilitated by the earlier confessions made by two principal suspects – Kunle Ogunleye and Michael Adikwu. “The arrests of the above mentioned five gang leaders and 17 others were made possible after the arrest of two principal suspects (Kunle Ogunleye, aka Arrow, 35yrs and Michael Adikwu an ex-convict) whose pictures captured by CCTV in one of the banks during the banks’ robbery were circulated to the media and the public. “The two principal suspects confessed to being among the suspects led by the five gang leaders listed above to carry out the Offa banks robbery, the attack on the Divisional Police Headquarters, Offa and the killings of 33 innocent persons on the 5th of April, 2018,” the police said. Meanwhile, the police disclosed that a total of 21 AK-47 rifles, which were carted from the Armoury of Offa Police Divisional Headquarters, had yet to be recovered. The following exhibits, according to the police, were recovered from the suspects: Two AK-47 rifles, two barrette pistols, one pump action rifle and one revolver pistol.